... well, lots of things: awesome, incredible, fascinating, one-of-a-kind. That point was driven home to me, if it hadn't already been, by seeing a particular Bald Eagle over Stevens St. in West Cape May this afternoon. Here in Cape May, we like to spout that there's rarely a time in the year that something isn't migrating through the peninsula when, in actuality, we don't even have to rely on the broad spectrum of taxa that violate local air space on their way between points A and B. To prove the point, all we really have to know is Bald Eagles. In Cape May, virtually any westerly or northerly wind -- particularly northwest -- brings raptors. It doesn't matter if it's October, February, April, or July; here, NW equals raptors. One of the species that is seen at the very beginning of hawk-count season in the fall here is Bald Eagle, as the last of the youngster Florida eagles pass through heading north cross paths with the first of the older Florida eagles on their way south for the breeding season. Somewhere near the beginning of the fall hawk count, young northern Bald Eagles start showing up on their way south and the rest of the season probably sees a mix of southbound northern and southern Bald Eagles. The last southbound birds, probably immature southern birds and adult northern birds, pass through in January. Shortly after the southward migration ceases, north-bound birds start appearing. This year, sometime in early February, I started doing a bit of hawkwatching at various Cape May sites, but particularly at the east end of Stevens St. in West Cape May. From the get-go, I noted Bald Eagles coming from across the bay and past me heading north. I wonder how many a spring hawk count would tally here. Yesterday, along with others, I counted raptors passing over Stevens St. from 11:30 am to 2:15 pm, recording 12 species of raptor, including that wonderful Swallow-tailed Kite and all three expected falcon species. The flight was dominated by Cooper's (17), Broad-winged (9), and Red-tailed (12) hawks. Nearly all of the Cooper's and Red-taileds were juveniles -- last year's young -- while there was a mix of ages of Broad-winged Hawks, which is to be expected, as the species' local migration timing is considerably later than that of Coop and Red-tail. 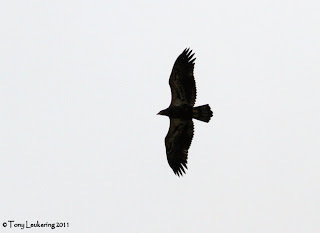 In that flight were two immature Bald Eagles, both obviously heading north. The wind was southwesterly. In today's northerly winds, many of those same observers conducted the informal hawk watch from about 10 am to 12:30 pm, seeing roughly equivalent numbers of birds, but of fewer species; no kites or falcons this time. However, we tallied 7 migrant eagles, 1 adult and 6 young birds. For most of the spring -- counting early February as spring for Bald Eagles -- all of the juveniles were obviously worn and, in recent weeks, most of them had initiated their prebasic molt -- many were missing at least one innermost primary on each wing. These are birds that are around one year old produced from northern nests. At 12:21 pm, when most of us were starting to pack up to look into other birding options, everything changed. The last counted Bald Eagle of the day (pictured above) came in from the south right over our heads and prompted this essay. That is because this bird is obviously in fresh juvenal plumage -- no molt, no wear, and all secondaries nicely pointed. Local juvenile Bald Eagles are still wearing downy white and adult Bald Eagles in the very far north may still be sitting on eggs. Thus, this bird probably became independent of its parents just this month and is the vanguard of the hordes of Florida-produced Bald Eagles that will be moving through Cape May and other eastern localities for the next few months. So, as you can see, there is rarely a time that at least one Bald Eagle is not moving through Cape May heading in one direction or another. I hear that Karen Johnson had a Cerulean Warbler up in Belleplain today too. The Birds of New Jersey is in the CMBO stores now!! The much-awaited new publication by Bill Boyle (with Kevin Karlson as Photographic Editor) is out and is a must-buy for anyone with an interest in the birds of the Garden State. Species texts are short, but there's a lot of information in there. Distribution maps are large and easy to interpret - but it's the great collection of photos that will really grab your eye first! All those amazing shots of outrageous birds that I missed because I wasn't living here then and people never stop going on about them? Well, now I have pictures of them to help me miss them even more!! Come get your copy now - and don't forget to get it signed at the Cape Maygration festival! It's been an exciting morning at Cape May, and setting up to continue into the weekend. Stormy weather yesterday seemed to stir things up and it's been an interesting day today. Not a day of masses of birds, but a day certainly of firsts-for-the-year for many! The CMBO Higbee's Beach walk had two Yellow-breasted Chats in song, two Black-billed Cuckoos and a fabulous Red-headed Woodpecker. A morning watch at the point provided an amazing seven Red-headed Woodpeckers skirting round the point - the highlight of a watch that also produced good numbers of Indigo Buntings, Blue Grosbeaks and American Goldfinches heading in off the bay. Two Gull-billed Terns, two Black Terns, two Parasitic Jaegers and a small shorebird passage (that included several Purple Sandpipers) made for an action-packed morning. Lunchtime, Scott Whittle deservedly stole the limelight with a Swallow-tailed Kite over the state park. It hawked insects around the island for less than an hour before disappearing south behind houses at the point and presumably heading off across the bay. OK, it's not up to the standard of Kevin's American Kestrel above, but you get the idea! Swallow-tailed Kite over Cape May Point today [photo by Mike Crewe]. Red-headed Woodpecker - a scarce bird here now so any picture is better than none (and I got none!) [photo by Karl Lukens]. A PILEATED WOODPECKER was seen circling Cape Island on Sunday, April 24th, 2011. A SCISSOR-TAILED FLYCATCHER was found at the South Cape May Meadows on Saturday, April 23rd, 2011, and was last reported there on Monday, April 25th, 2011. A GLAUCOUS GULL was observed at St. Mary’s beach in Cape May Point on Wednesday, April 27th, 2011. Two reports of RED-HEADED WOODPECKER have come in over the past week: one was seen at Higbee Beach WMA on Sunday, April 24th, 2011, and another was reported at the Cape May Point State Park on Wednesday, April 27th, 2011. 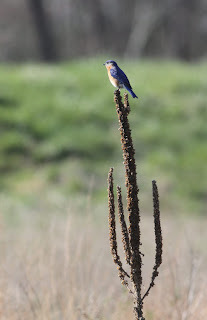 The following are first of spring arrivals for 2011: BROWN PELICAN 4/23; INDIGO BUNTING, ROYAL TERN 4/28. Though it's not an exceptionally early date, a Brown Pelican seen flying south of Higbee's Beach on the evening of Saturday 23rd is worthy of note and a sure sign that warmer weather isn't too far away now. Brown Pelican winging it past Higbee's Beach on 23rd - a great find for New York City girl Dawn Hannay. A young birder named Paul sent me a comment on my personal blog about a quiz photo on View from the Cape from February 7, 2011: ". 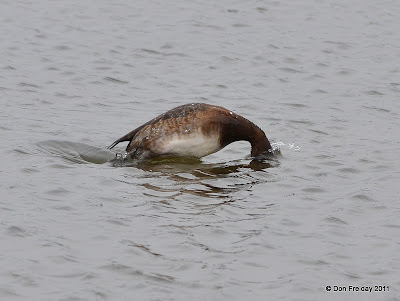 . . Could you please answer a question from the "View from the Cape" blog from February 7, 2011 about the diving duck? How can you tell the difference between greater and lesser scaup when you can't see the wing stripes and shape of the head? Thank you very much! - Paul, age 11." The answer, Paul, is if I can't see head shape or wing stripe on a scaup, I can't identify it, and sometimes, although I'm getting better at it, I can't identify individual scaup even if I can see every part of the bird perfectly! I knew this bird was a Greater Scaup because I spent about 20 minutes studying it as I photographed it, and saw the wing stripe extending well out onto the primary feathers when it preened, and got a good fix on the head shape - peak over the eye, sloping rear crown - when it was in a relaxed pose. A question I often ask myself is why, after over 30 years of birding, do I still sometimes have trouble with scaup? The answer is, they are tough to sort out! All that being said, I would have guessed Greater Scaup on this photo thanks to one minor supporting mark - the thick-looking neck. Thanks for asking, and let us know if you find a favorite way to tell the scaup apart! Taking a day off this time of year is never a good idea when there's a blog to be done! So, here's a roundup of sightings from the last couple of days. First the real big news, in case you didn't already hear; Jim Dowdell (he of the Ivory Gull and so many other good birds!) had the amazing fortune to have a Pileated Woodpecker fly over the South Cape May Meadows on Sunday morning. Though people were out looking, the bird inevitably disappeared; remarkably however, Jim saw the bird again in flight some 20 minutes later, heading towards the lighthouse. I can't help but picture it flying right past my office window whilst the Northwood Center was closed on Sunday!! Whilst on woodpeckers, it's worth mentioning the Red-headed Woodpecker which put in an appearance on the Sunday morning Higbee's Beach walk; this species has become very scarce at Cape May and any sighting you may have of one anywhere in South Jersey is worth reporting. Ovenbird 87, Black-and-white Warbler 31, White-eyed Vireo 17, Pine Warbler 36, Yellow-throated Warbler 4, Worm-eating Warbler 6, Hooded Warbler 2, Wood Thrush 3, Blue-headed Vireo 1, Louisiana Waterthrush 3, Blue-gray Gnatcatcher 24, Chipping Sparrow 26, Tufted Titmouse 53, Carolina Chickadee 34, Eastern Towhee 29. Ovenbird 186, Black-and-white Warbler 62, Worm-eating Warbler 32, Great Crested Flycatcher 9, Hooded Warbler 8, Prothonotary Warbler 2, Blue-winged Warbler 1, Louisiana Waterthrush 2, Pine Warbler 57, Yellow-rumped Warbler 46, Red-eyed Vireo 6, Blue-headed Vireo 4, White-eyed Vireo 31, Blue-gray Gnatcatcher 55, Wood Thrush 13, Scarlet Tanager 2, Acadian Flycatcher 1, Blue Grosbeak 1. One thing is for sure - the Ovenbirds are in now! Louisiana Waterthrushes can be elusive and hard to see (but please don't go off trails in search of them, there's rather more birdwatchers than Louisiana Waterthrushes in Belleplain!). Occasionally though, time and place come together nicely, as it did for Karl Lukens here after one of this weekend's Belleplain walks. Blue-gray Gnatcatcher at its nest in Belleplain State Forest on Sunday [photo by Roger Horn]. Cape May Point seemed to get progressively quieter for birds over the Easter period as we await the next wave of incoming migrants, but the Scissor-tailed Flycatcher remained through Monday and gave much pleasure to its admirers, while at least two Virginia Rails were heard calling in the meadows. At The Beanery, Vince Elia reported Broad-winged Hawk, Baltimore Oriole, Prothonotary Warbler and Warbling Vireo on Sunday, as well as a getting-late Rusty Blackbird. And talking of getting late, a Pine Siskin at the Northwood Center on Monday was certainly unexpected! The Glaucous Gull was reported at least to Monday and may still be in the area around 2nd Avenue jetty on the beach front. Freshly arrived at Karl Lukens feeder, a fine male Rose-breasted Grosbeak. 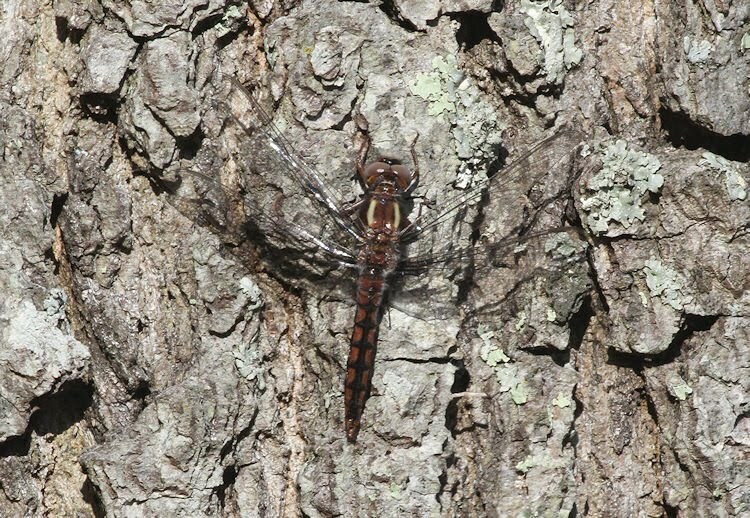 Tony Leukering, Glen Davis and I checked out a few butterfly and dragonfly locations this weekend and found good numbers of early-season darners now arriving - though both Harlequin and Springtime Darners should be out now, they are very hard to tell apart unless you get a good look at a perched individual (we didn't!). Will Kerling recorded 16 species of butterfly on one of his regular count sites recently and this is certainly a good time for elfins, Falcate Orange-tip and other early season aspecies. I've seen Eastern Tiger Swallowtail, Gray Hairstreak and Pearl Crescent over the last few days and both American Ladies and Common Buckeyes are now pushing up from the south. Warmer days bring out the reptiles too! This Black Racer put on a fine mock-rattlesnake display, vibrating its tail in the leaf litter to great efffect [photo by Mike Crewe]. There are no venomous snakes in Cape May County, but Northern Water Snakes can turn agressive if you try to handle them [photo by Will Kerling]. Northern Fence Lizards are just emerging from hibernation at several locations now. Look for them in warm, sandy places where they can bask in the sun [photo by Will Kerling]. Frosted Elfin at Lizard-tail Swamp. Best told from the more common Henry's Elfin by the black spot in the submarginal pale band on the hind wing and by the white line on the forewing which forms a continuous wavy line on Henry's and a series of disjunct white dashes on Frosted [photo by Mike Crewe]. The season's first Scissor-tailed Flycatcher was enjoyed by many people today, along the south side of The Nature Conservancy's Migratory Bird Refuge (known to us all as the South Cape May Meadows). I later heard of a message left on the Northwood Center voicemail from a caller who reported the bird late on Friday. If you let me know your name, I'll credit you as the finder! Wet and windy weather overnight didn't deter birders and plenty of people were out under overcast skies and in blustery winds to enjoy Cape May and its birds. Lake Lily was pretty amazing this morning as a smorgasbord of hirundines caught insects low over the water - and along nearby streets too. Barn, Bank, Tree, Cliff and Northern Rough-winged Swallows were all there to be found, along with one or two Chimney Swifts which joined them for a while. The Glaucous Gull was reported from South Cape May Beach this morning and good numbers of warblers continue around the Northwood Center. The sun is putting in an appearance now and promises to show up for tomorrow - let's bird! Tony Leukering somehow managed to get this awesome shot of the Scissor-tailed Flycatcher today. Not only did he get the bird, but you can see a stack of flies in the picture too! The sharp-eyed amongst you all will notice the very narrow outer portion to the outermost visible primary, which makes this an adult male. The super long tail and extent of red supports this too. An “AUDUBON’S” YELLOW-RUMPED WARBLER was in Cape May Point on Sunday, April 17th, 2011, and was last reported at the junction of the red and yellow trails in Cape May Point State Park on Tuesday, April 19th, 2011. Two reports of SWALLOW-TAILED KITES have come in over the past week: the first was located over the Beanery on Thursday, April 21st, 2011, and the second was observed over Belleplain on Friday, April 22nd, 2011. A SANDHILL CRANE was seen at the Beanery on Saturday, April 16th, 2011. Two NORTHERN BOBWHITES were heard at the South Cape May Meadows on Friday, April 22nd, 2011. A second year GLAUCOUS GULL was observed at the Second Avenue Jetty on Tuesday, April 19th, 2011, and was located there again on Friday, April 22nd, 2011. A SHORT-EARED OWL was noted hunting the Glades Wildlife Refuge in Cumberland County on Monday, April 18th, 2011. The following are first of spring arrivals for 2011: PROTHONOTARY WARBLER, EASTERN KINGBIRD 4/17; YELLOW WARBLER, WORM-EATING WARBLER 4/18; HOODED WARBLER 4/19; GREAT-CRESTED FLYCATCHER, BLUE-WINGED WARBLER, AMERICAN REDSTART 4/20; SCARLET TANAGER, CEDAR WAXWING 4/21. There was a real nip in the air pretty much all day today, after temperatures dropped down into the 30s overnight and a northerly component crept into the wind. Still, a nice run of birds was reported; late news on Thursday included two Cattle Egrets at The Beanery, while today saw reports of the Glaucous Gull still at 2nd Avenue Jetty, a Swallow-tailed Kite over Belleplain (one was reported 'up north' in Somerset County on Thursday too) and a Horned Grebe in Jarvis Sound, seen from The Osprey this morning. The Higbee's Beach walk was cold and blowy, but a reasonable number or birds eventually put in an appearance, including a brace of Little Blue Herons overhead. Ruby-throated Hummingbirds continue to pop up at scattered localities, with at least two at our Goshen center today - though sadly one of them was picked up dead by Pete Dunne during the afternoon. Cliff Swallow, Chimney Swift and Blue Grosbeak have all been noted around Lake Lily both yesterday and today, Yellow Warblers continue to trickle in and our White-crowned Sparrow is still singing in the yard. Things look good for birding this Easter weekend - so don't miss out on the action! Another couple of sightings continues the mixed up day we've been having; the season's first Swallow-tailed Kite was just reported from The Beanery - just as I was pondering on why there was a male Surf Scoter on Lake Lily - a good new bird for my Northwood Center list! April has a habit of teasing us and that has certainly been the case over the past 24 hours. Wednesday was decidedly warm and sunny and I went to bed listening to the mad chorus of Spring Peepers and Fowler's Toads. A few American Toads could be heard too; according to the books, they don't occur here, but amphibians (and reptiles) often get moved around by people and doubtless someone decided they's make a nice addition to the local pond. The winds changed, however, and today saw us back in winter coats for the Birds, Bugs & Botany walk at the state park, as a brisk north-westerly pelted across the parking lot. Northern Rough-winged, Barn and Tree Swallows were whipping around low to the ground, along with a few Purple Martins, but the real show that the wind laid on for us was a spectacular gathering of at least 500 Northern Gannets (and that was just in our bit of the bay! ), many of which were plunge diving for fish. Lake Lily and the area around the Northwood Center remains the prime location for warblers right now, with Yellow-rumped Warblers well into double figures, a smattering of Yellow Warblers today and the odd Prairie, Palm, Yellow-throated, Black-throated Green and Northern Parula thrown in for good measure. Small parties of Glossy Ibis and Great and Snowy Egrets drifted north this morning and yesterday gave me the typical mixed-up April scenario of hearing my first Ovenbird of the year singing at Cold Spring, followed by a Winter Wren at the Northwood Center! Other reports: Wednesday - Great Crested Flycatcher at Belleplain, Blue-winged Warbler at Cape May Point, American Redstart at Peaslee WMA and a handful of incoming Ruby-throated Hummingbirds. Thursday - Scarlet Tanager and Cedar Waxwings at the point; this morninig I also saw my first 'western' Palm Warbler of the spring. OK, here's a tester for you - where in the world can you see Audubon's Warbler, Prothonotary Warbler and Glaucous Gull in the same day? No, make that in the same lunch break!! The answer, of course, is Cape May - wonderful Cape May (have I said that before?!). Here's a quick picture essay from lunch time today which really should have you heading this way as soon as you can! Northwood's Prothonotary Warbler continued to show well today and I couldn't help but take a few shots [photo by Mike Crewe]. A Rent In The Space-Time Continuum! All this high-tech that flies around cyberspace is all very well until the Human element gets added in - and by that I mean me!! With the powers of modern technology, we can talk to someone instantly on the other side of the world and get split second updates on the very whereabouts of a good bird long before we ever clap eyes on it. But if you're a bit borderline as far as the young, hip hop and trendy world of instant messaging and needing to know what your best friend had for breakfast before they've cleaned the plate is concerned, you can get a bit turned around in the immediacy of it all and start to wonder whether time isn't just coming in random pockets (Rimmer and Lister would know what I'm talking about!). What am I waffling about? Well, I got in to the office this morning afer a day off and downloaded the usual abundance of emails that await me on a Tuesday, among which were proofs for the next Kestrel Express. So I phone Joan Snider who does a great job putting this together for us - only to discover that she is based in Arizona and not in New Jersey at all!! So there's my first issue as Joan would really rather still be in bed! Anyway, whilst on the phone to Joan, I glanced out of the window and there, literally 12 feet from my face (I measured it with the camera autofocus (probably another weird space-time-distance related thing! ), was a storming adult male Prothonotary Warbler - actually closer to me than my camera was! So now Joan, in Arizona, knows about it before the people in the next room! The bird disappeared and I got no photos, so on with the emails. Well, the next topsy-turvy scenario was the discovery of two emails, sent the day before, of photos of the very same bird. So now I know that a bird was present yesterday and have seen photos of it - but not before I saw it myself today!! I gotta go have a lie down in a darkened room and work this all out. Chip and Kim Bauer get the credit for finding this handsome male Prothonotary Warbler at the Northwood Center on Monday and it continues today. Whilst Chip never quite got the ideal shot as the bird dipped around behind branches and other objects, Beth Polvino happened to chance across the bird herself later on Monday and sent me this great shot. Another great shot from Beth Polvino of a breeding-plumaged male Palm Warbler. Note the chestnut cap. Birds with yellow on all underparts like this one are from the eastern population; western birds have the yellow more restricted. Other updates: Monday saw a good movement of Willets with Tony Leukering reporting 79 passing St Peter's in 80 minutes in the morning. Other highlights on Monday included an Orchard Oriole at Lake Lily and a Broad-winged Hawk reported at Cape May Court House. So far today, the Audubon's Warbler has been seen again, this time around the red trail in Cape May Point State Park, while Belleplain observers reported both Wood Thrush and Hooded Warbler this morning. A hungry Merlin dropped into my bayshore yard this afternoon to grab a bite to eat. The menu special? Fresh Starling. The following video is about a minute long, and depicts the scene as I viewed it from my front window. Quality is not the best, as footage was shot with a point-and-shoot camera. 65 Myrtle Warblers, 1 Audubon's Warbler, 2 Yellow-throated Warblers, 3 Northern Parulas, 2 Prairie Warblers, 3 White-eyed Vireos, 2 Ruby-crowned Kinglets, 4 Golden-crowned Kinglets, 8 Eastern Kingbirds, 4 Palm Warblers, 14 Blue-gray Gnatcatchers, 3 Pine Warblers, 2 Gray Catbirds, 2 Black-and-white Warblers. 2482 Northern Gannets, 1800+ Double-crested Cormorants, 35+ Common Loons and one Parasitic Jaeger. A very strong rumor suggests that tomorrow morning it could well be worth your while being at Cape May Point - the weather patterns bode well for a rush of birds!! Audubon's Yellow-rumped Warbler at Cape May Point this morning. Besides the obvious trademark yellow throat (which forms a much smaller pale throat mark than the extensive white patch on Myrtle Warbler), note the lack of a white supercilium, gray face, more extensive white edges to the greater coverts and more extensive black blotching on the breast [photo by Mike Crewe]. Yellow-throated Warbler - one of two that at one point were both in the same tree beside Lake Lily this morning. Note the small amount of yellow on the front of the supercilium - I don't know what this means if you want to know what subspecies it is! [photo by Mike Crewe]. Other news today included Prothonotary Warbler at Belleplain, Virginia Rail calling at South Cape May Meadows and a Stilt Sandpiper at the latter site late on Saturday. The Sandhill Crane seen at the start of Saturday morning's Beanery walk did not get reported today. Hold on to your hats, er... binocular! While it's still "only" mid-April, tonight's predicted weather pattern looks very promising for migrants on the ground and in the air tomorrow in Cape May (see woodcreeper.com for Dave La Puma's thoughts on the matter). I would suspect that the whole peninsula will benefit from the flight, but the Bayshore might be the best place to be and I suspect that tomorrow could easily be a double-digit warbler-species day. I'm hoping for Clapper Rails over my house tonight! Awards were officially given out this afternoon to all those involved in the Lower Cape May Meadows-Cape May Point, New Jersey Ecosystem Restoration Project. This project first began way back in 1987, with actual on-site re-construction work starting in 1999. It's taken a long time, but has resulted in all the ponds, marshlands and beach habitats that you see stretching non-stop from Cape May City all the way to the lighthouse. Awards were received by The Nature Conservancy, New Jersey Chapter; Cape May Point State Park; Borough of Cape May Point; New Jersey DEP, Division of Fish & Wildlife, Endangered and Non-game Species Program; New Jersey DEP, Bureau of Coastal Engineering and the US Army Corps of Engineers, Philadelphia District; US Fish & Wildlife Service, New Jersey Field Office. It's been quite a project with an amazing number of organizations involved - so my award goes to the person who had to pull it all together! It was a chilly and very windy day for awards at the state park today, but at least the sun was shining for the photo shoot on the Hawkwatch Platform [photo by Mike Crewe]. Chris Hajduk saw a White-breasted Nuthatch at the coastguard base (though I don't know the date) but it follows a recent slight increase in sightings of this species elsewhere and suggests that birds are returning north after an impressive southward movement last fall. Chuck-will's-widows never make a major impact on arrival but slowly make their presence heard; Cynthia J Allen tells me that one calling in her yard this morning was her earliest date ever by five days. 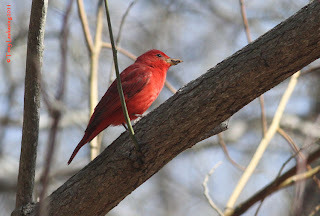 Beth Polvino had a nice fall of birds in the old heronry sanctuary at Stone Harbor, including more than one Summer Tanager - which ties in with Tony's in his latest post below. 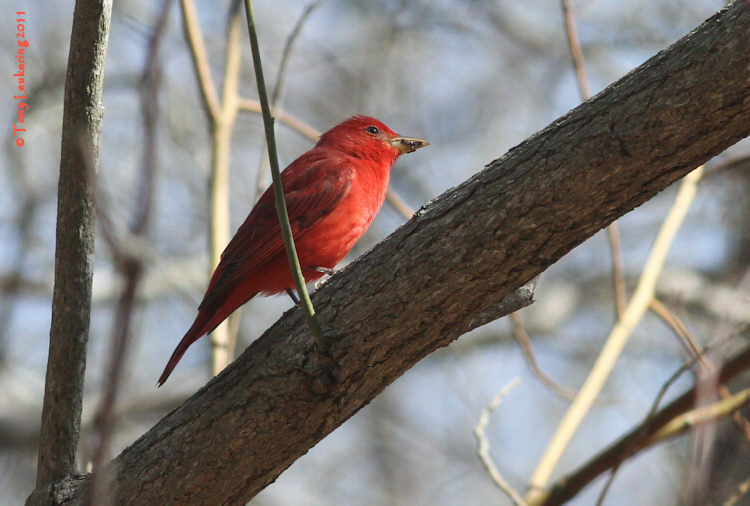 Day-glow male Summer Tanager at Stone Harbor [photo by Beth Polvino]. Tree Swallows lead the vanguard of hirundines pouring back through Cape May Point; these two were arguing over perching rights at the Wetlands Institute [photo by Beth Polvino]. With an afternoon free, I headed down to Cape Island in hopes of the FOY Broad-winged Hawk in the NW winds. That was not to be, but the low-density, but steady flight of American Kestrels heading west around the Cape was enjoyable. A very quick visit to the Cape May Migratory Bird Sanctuary (on the West path only) produced a FOY Bank Swallow, but nothing else of particular note. However, later in the day, Chris Vogel found an American Golden-Plover along the East path. I knew I should have walked the whole loop! At the east end of Wilson St. in West Cape May, I ran across a strongly singing Prothonotary Warbler; a nice surprise and another FOY. In the northern wet woods at Villas WMA, a red bird caught my attention while I was trying to photograph Hermit Thrushes. I am glad I looked at it, as it wasn't the male Northern Cardinal that I was expecting, but an adult male Summer Tanager (FOY)! Also in the wet woods was a FOY Pearl Crescent and my personal FOY Prairie Warbler. At the Bridge Pond, I saw FOY Fragile Forktails and my personal FOY Blue Corporal, though the latter I misidentified as Stripe-winged Baskettail as I didn't really look at it -- I just photographed it extensively. When Mike Crewe showed up to look at my good find, I realized that I had seen, but not really noticed, the typical corporal bars (see below). Ah, well. North of the Bridge Pond, I ran across a nice mixed flock of birds, with the below strongly-singing Eastern Bluebird (perched on last year's Common Mullein stalk) and the two remaining regular 'P' warblers for New Jersey: Pine Warbler and Palm Warbler (the Palms were all Yellow Palms as expected this early in the season). So, I managed all four NJ 'P' warblers (warbler species whose names begin with 'P') despite only running across four species of warblers all day! This is the Cape May Birding Hotline, a service of New Jersey Audubon Society's Cape May Bird Observatory. This week's message was prepared on Thursday, April 14th, 2011 Highlights this week include sightings of BLACK-HEADED GULL, NORTHERN GOSHAWK, CATTLE EGRET, COMMON EIDER plus first of spring arrivals of RUBY-THROATED HUMMINGBIRD, BLACK AND WHITE WARBLER, OVENBIRD, BLUE-HEADED VIREO, SOLITARY SANDPIPER, COMMON YELLOWTHROAT,WHITE-EYED VIREO, PRAIRIE WARBLER, HOUSE WREN, EASTERN WILLET, BLACK SKIMMER. Three BLACK-HEADED GULLS were noted off of East Point in Cumberland County on Saturday, April 9th, 2011. A NORTHERN GOSHAWK was seen at Stimpson’s Island Road in Dennis Twp. on Friday, April 8th, 2011. Multiple reports of CATTLE EGRETS have come in over the last week: two were seen one mile south of the CMBO’s Center Research and Education on Route 47 in Goshen; a single bird was observed at the intersection of Bayshore and New England Road in West Cape May; and another lone bird was found in the vicinity of the Eastern Shore Nursing Home on Route 9 in Cape May Court House on Wednesday, April 13th, 2011. A pair of COMMON EIDERS was observed off of Miami Beach on Sunday, April 10th, 2011. The following are first of spring arrivals for 2011: RUBY-THROATED HUMMINGBIRD 4/7; BLACK AND WHITE WARBLER, OVENBIRD, BLUE-HEADED VIREO, SOLITARY SANDPIPER 4/10; COMMON YELLOWTHROAT 4/11; HOUSE WREN, WHITE-EYED VIREO, EASTERN WILLET, PRAIRIE WARBLER 4/12; BLACK SKIMMER, BLACK-THROATED GREEN WARBLER 4/13. April is a month famous for its showers and, growing up inland in the UK, I soon learned that showery weather brought birds to my local gravel pits. Spring migrants often pass high overhead, keen to get moving while the weather is good. But faced with a squally patch of weather, they will drop down into a patch of suitable habitat until the weather changes (often less than an hour at this time of year). Such weather prevailed this afternoon and caused a wonderful selection of birds to descend into evergreen cover around the Northwood Center. The majority were Blue-gray Gnatcatchers - perhaps 25 of them flitting after gnats along the roadside out front. With them were some 20 Ruby-crowned Kinglets, 15 Golden-crowned Kinglets, 10 Yellow-rumped Warblers and single Yellow-throated, Prairie and Black-throated Green Warblers, Northern Parula and White-eyed Vireo and at least two Brown Creepers. Lily Lake attracted around 80 Barn Swallows, 15 Tree Swallows and two Northern Rough-winged Swallows - oh, and a Bonaparte's Gull! Elsewhere today, Tom McParland had four Willets at Shellbay, Tom Reed had a Black Skimmer fly past the concrete ship and the Eastern Shore Nursing Home along Route 9 at Cape May Court House followed a familiar pattern from previous years in attracting a Cattle Egret. Much discussion followed the reporting of the Yellow-throated Warbler at Northwood, which was of the race albilora with no yellow on the front of the supercilium (sometimes called the supraloral spot). Interestingly, spring migrants in the south of Cape May County seem to be mostly - if not all - of this race, whilst breeding birds in the north of the county are of the race dominica, with yellow at the front of the supercilium. Remember to check out those Yellow-throated Warblers should you be lucky enough to find one! ****Just a couple of reminders about recent walk changes; today's Nummy's Island walk will take place at Stone Harbor Point again, but we expect the free bridge to be open for next week's walk. We suggest approaching Nummy's Island from the Stone Harbor end as per our usual information, that way you'll know for sure next week and won't get caught on the wrong side! Latest news I have from the point is of a Cattle Egret found (by Chris Vogel) on the field east of Bayshore Road, just south of the junction with New England Road. This field is part of Higbee's Beach WMA and has just been cut by NJ Wildlife staff, so probably has plenty of insects to offer a passing egret. A Yellow-throated Warbler was at the state park this morning and Tom Parsons tells me he saw one at the Northwood Center on Tuesday. This is a scarce bird south of the canal but may be on the increase, so keep an eye out for them. Karen Johnson certainly sent me what looks set to be picture of the week - a brood of four American Woodcock chicks, photographed by Brian Johnson in Cumberland County. Take care where you put your feet out there! Karen Johnson tells me that Black-and-white Warblers continue to increase at the top end of the county and Blue-gray Gnatcatchers are already nest-building. Having all these warblers now coming through reminds me just how important knowing the calls and songs of spring migrants really is. Have you ever stopped to think about how many birds you make a mental note of after hearing them, but you don't ever catch a glimpse? Or how many more birds you may detect if you did know the calls, but currently don't? We have a couple of birding programs coming up next month which fit the bill perfectly - you could try either our Birding By Ear workshop with the incomparable Michael O'Brien, or the awesome Spring Migration Peak Week workshop with the equally-talented Lousie Zemaitis (actually I think I've got to find a way to sneak in on both of those!). A male Painted Bunting is currently visiting a feeder in Absecon for about a week now. The home owners, Don and Annie, have granted permission for birders to view the bird. Birders are welcome to walk along the right side of the house and view the feeder that's in the back yard. The neighbors are really nice which is a plus. This bunting has quite the host! The bird comes regularly, at least once an hour. Be careful not walk on the darker area where new grass seed has been planted (along the left side of house as you face it). Higbee's Beach was hopping this morning with the first real push of birds. A good turn-out of birders ensured good coverage and also demonstrated how birds weere moving through quickly, as we all got different tallies. Dark-eyed Juncos and Chipping Sparrows dominated the floor space, while upper branches bounced up and down as Palm and Yellow-rumped Warblers moved through the canopy. Single male Black-and-white and Prairie Warblers were singing and looking glorious, despite overcast skies. A Whimbrel flew north noisily and two Willets passed by. Several Eastern Towhees and at least four White-eyed Vireos were in song and two Blue-headed Vireos and a House Wren were noted. The back end of winter was signalled by a couple of Pine Siskins passing over - though they were strangely heading south! For me, a nice finale as I was about to leave was a Ruby-crowned Kinglet, ruby crest raised to full extent, as it sang from an arching rose stem right beside the parking lot - marvelous! Chipping Sparrows are passing through in good numbers right now and look glorious in dapper breeding plumage [photo by Mike Crewe]. It really was a weekend of contrasts this weekend and if you missed out, it may be because you were as confused as the weathermen clearly were as to just exactly what the weather was going to do at Cape May and how it would affect your birding! Friday saw the weekend start in good fashion with Beth Ciuzio reporting a Lousiana Waterthrush at Lake Nummy in Belleplain State Forest and the following day Dave Lord reported a Black-and-white Warbler from near Tarkiln Pond along Weatherby Road. Sam Galick found a Northern Goshawk on Stimpson Island Road (not far from Eldora on the bayshore) and followed it with news that at least three Black-headed Gulls are still present at East Point. Sunday really felt like spring - though it depended where you were! News came thick and fast from Belleplain with Don Freiday, Janet Crawford and Karen Johnson all reporting good birds, including Solitary Sandpiper, Blue-headed Vireo, Black-and-white Warbler, Ovenbird, Blue-gray Gnatcatcher and singing Eastern Towhees and Yellow-throated Warblers. Don also reported a singing Fox Sparrow at Lake Nummy. The southern half of the peninsula remained rather more quiet, though Tony Leukering and I had a pair of Common Eiders on the bay off Miami Beach. Monday had shown promise weatherwise (depending on which part of the forecast you read!) but in the event, fog clouded the issue in more ways than one! Vince Elia found three Common Yellowthroats at the state park. After the fog had lifted, an hour at St Peter's produced a nice Northern Gannet flight with at least 130 birds coming out of the bay while we were there, along with a movement of Surf and Black Scoters, three Long-tailed Ducks, a small passage of Common Loons and a few skeins of Double-crested Cormorants. The gracefulness of Northern Gannets perhaps makes them the nearest we can regularly get to watching albatrosses in the Northern Atlantic. I never tire of watching them arc around Cape May Point [photo by Mike Crewe]. I checked Villas WMA on Sunday morning and found that the gates are now open and the demolition of the old buildings there is now complete. Some peculiar rearrangement of the paved walkways is going on but otherwise the site is open for birding again so do drop in. Currently, at least two pairs of Eastern Bluebirds are showing interest in the boxes and Chipping Sparrows and Pine Warblers are in fine song. Now is a good time to get to grips with the elfins. Henry's Elfins are out in good numbers at the moment - look for the little white spot on the hind wing and the lack of a dark spot in the pale, outer band on the hindwing. The lack of white would make it a Brown Elfin; the presence of a dark spot would make it a Frosted Elfin [photo by Mike Crewe]. Monday rounded off with two Cattle Egrets reported along Route 47, about a mile south of the CMBO Goshen Center and the second Ruby-throated Hummingbird of the year in the area﻿. A few bits and pieces drifted through to me today from other observers - all classic cases of being in the right place at the right time! Mike Newlon reported hearing a Black Rail at Thompson's Beach, Cumberland County on April 6th, while nearby Heislerville held a great range of wadingbirds and shorebirds, including 3000 Dunlin. April 7th, Derk Visser reported his first Brown Thrasher on East Point Road and nine Whimbrel on the saltmarsh at Avalon. He also noted three Yellow-throated Warblers along Jakes Landing Road the same day. April 7th also saw a good run of birds at Higbee's Beach which most of us missed; Chris Vogel reported Eastern Kingbird, Blue-headed and White-eyed Vireos, Yellow-throated Warbler, 10 Palm Warblers, 30 Blue-gray Gnatcatchers, six Ruby-crowned Kinglets and three White-breasted Nuthatches. Today was a day of two halves for me; a morning Birds, Beasts & Botany walk at Cape May Point State Park, then a lunchtime drive around Belleplain State Forest (with a fair wack of paperwork between and after!). The end result was six species of warbler, which is always nice this early in the year. The BBB walk turned into a session of comparing and contrasting - various pines and how to tell them apart, and looking at the differences between the native Pennsylvania Bittercress and the alien Hairy Bittercress. Birds were good to us too and we enjoyed four Chipping Sparrows (the Tsip in the title) in full breeding plumage on the Hawkwatch Platform hand rail, a full breeding-plumaged Palm Warbler of the colorful eastern form and plenty of passage Yellow-rumped Warblers. A calling Golden-crowned Kinglet, three Ospreys and two American Coots all added to our lists nicely. Dropping into the Northwood Center afterwards, I heard a Northern Parula singing right outside in the lakeside poplars and several of us got nice views of it as it sang from bare branches (the Zo zo.....thing in the title). Male Northern Parula wondering where all the leaves are at the Northwood Center today [photo by Mike Crewe]. Belleplain is pretty quiet this time of year - and lunchtime is never a great time for bird song, but you never know! But you think that I would know by now, because I did my usual - no camera and a Louisiana Waterthrush (the Spich in the title) feeding not 30 feet from me in full sun at one point, on a quiet little backwater!! Pine Warblers were singing on and off and - just as time ran out and I was heading back to the car - a Yellow-throated Warbler started to sing. Butterflies deserve a mention now and again and today wasn't too bad for them; several Question-marks, an Orange Sulphur and at least 10 azure things (don't ask!) were all nice, but eclipsed by the nice count of 38 Henry's Elfins along Narrows Road. Not that many of the small Lycaenids (that's blues and hairstreaks to you and I) like to sup mineral salts from dirt roads, so do be careful and attentive to them when you drive these routes. Male Purple Martins look black from a distance, but when the light catches them, they have a nice blue-purple shine to them [photo by Mike Crewe]. Female Purple Martins lack the shine of the males and are pale gray below with a pale collar [photo by Mike Crewe]. Purple Martins were first noted back at the state park on April 4th I believe and have been seen daily since, though this morning, a Merlin perched on one of the boxes may have been responsible for them being notable by their absence! 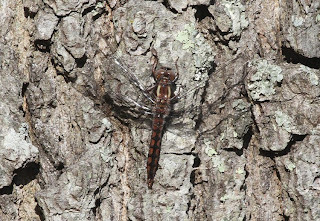 Other news includes the first Green Darner of the year reported to me by Glen Davis on 6th, a continued scattering of Blue-gray Gnatcatchers, Chimney Swifts and Glossy Ibises from various locations and - right this past few minutes - a Ruby-throated Hummingbird noted by Louise Zemaitis in Villas. With The Birds Come The Birders! Birds are arriving daily in good numbers now and each morning is full of promise as we scour Cape May to see what has arrived or what is still passing by offshore. I have just posted a whole bunch of Field Trip Reports, so please do click here to see what's being seen on our walks - it doesn't all find its way to this page! Yellow-crowned Night Herons have been trickling in over the past few days, but this is the first photo I've seen so far this year of a newly-arrived, smart adult [photo by Marvin Hyett]. A lone American Coot was at Bunker Pond last week and this bird at The Meadows on Saturday may well be the same one. American Coots don't breed with us and ship out fairly early in the spring. This year we lost most of them when all the ponds froze over and they didn't come back - can't say I blame them! [Photo by Chris Borkowski]. "Looks like a tiny Dunlin" is not a bad way to think of a Western Sandpiper. Will Kerling took this group of Dunlins and Western Sandpipers at Stone Harbor Point last Saturday. These two American Oystercatcher photos are wonderful as they show a bird bouncing along on a single leg - in both shots it's completely clear of the ground! Birds often roost on one leg as we all know (and this bird had two fully-functioning pins) but they also frequently hop along somewhat awardly on one leg, when using two would be so much easier you would think. I've often pondered on this and have no idea why they would do it. This 'blonde' female Mallard has frequented Cape May Point for some years now, but I've never known anyone photograph it! It's worth being aware of any oddball birds like this on your local patch so that you don't fall into the trap of thinking it might be something rare. Mallards in particular are prone to throwbacks to a domestic past, thanks to many generations of tinkering by Mankind. Khaki Campbells, Indian Runners and those white things in your local park - they're all Mallards but it may not always be immediately apparent! ...and if you ever get fed up looking at Mallards - just remember, they're equally as attractive as everything else on the pond! Those who attend my walks around Cape May Point will know that I bang on about 'Polish' Mute Swans a lot! They're the form with the pinkish rather than black legs and which have white down as a hatchling rather than gray. This picture shows a female, as told by the small knob on the bill at this time of year (though some unpaired males can look like this in spring too) and has pink legs. I read on the internet that the pink leg thing is only found in females, which seemed odd to me as it would mean that all of the young swans hatched at Cape May Point last year were females. However, it is clear by looking at paired birds at the state park right now that this is not so - the males there have pinkish legs too.